AdBox Neo enables content owners to maximise their business potential by targeting advertisements for specific audiences with ad insertion and Digital Programme Insertion (DPI) in both SD and HD, in either SDI or DVB (ASI/IP). AdBox Neo performs basic cost-effective digital ad insertion and can easily be scaled to meet the next-generation of targeted advertising solutions that are driving the revolution in today’s television advertising. It is based on AirBox Neo, the industry's most advanced channel-in-a-box technology, delivering the power and scalability to meet the demands of today's rapidly changing advertising environment, and giving a quick return on investment by providing the solution you want, at your price. AdBox Neo can be installed locally or remotely at the headend and monitored and controlled via the internet. If required, many hundreds of hours of ad insertion and DPI can be scheduled and an entire standalone solution can be provided, or alternatively it can be integrated into the content owner’s current workflows and systems. In addition to ad insertion and DPI, AdBox Neo can include graphics capabilities ranging from simple logo insertion to full CG and interactive graphics insertion - using TitleBox Neo to enable a complete and very powerful local branding solution including SMS2TV. AdBox Neo can be integrated into clients’ traffic systems to enable traffic and billing to provide the complete one-box solution that includes automation, video server and switching. It works by receiving a GPI or Cue Tone trigger for the start of commercial break or programme insertion. Other trigger sources can also be handled via GPI or Cue Tone from an external cue decoder. Once the trigger is received the scheduled advert break or programme is switched from the live feed and played to air. After a scheduled period, or on receiving a second trigger, AdBox Neo returns to the live programme feed. AdBox Neo will only insert advert breaks or programmes during predefined or scheduled periods. It can also auto-fill any periods that have no defined adverts or programmes. PlayBox Neo IP Switch is a cost-effective UDP IP switch. It uses commercial-off-the-shelf (COTS) IT hardware for single or multiple AdBox Neo systems where multiple inputs and/or output routing/switching is required. 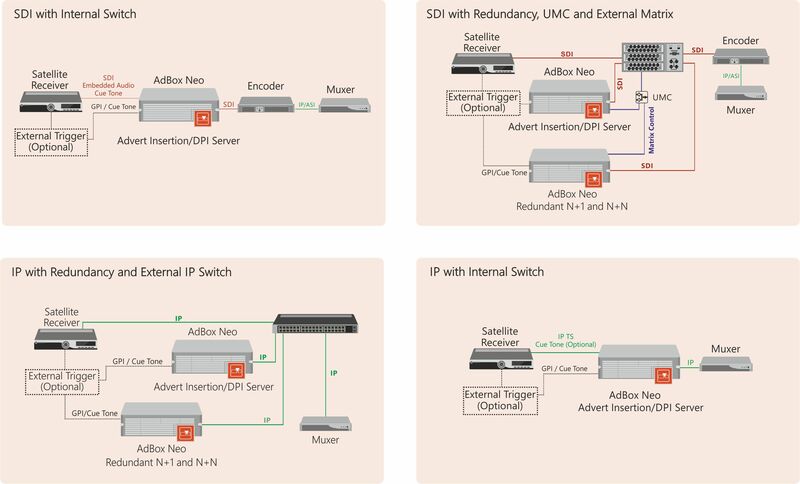 IP Switch can be installed in AdBox Neo or installed in a separate server in multiple AdBox Neo installations. PlayBox Neo Universal Matrix Controller (UMC) provides central control for routers/matrices that enable multiple AdBox Neo installations to centrally control the switching for ad insertion and DPI. UMC is fully integrated with AdBox Neo as well as installations containing AirBox Neo, CaptureBox Neo and MultiBackup Manager (MBM). PlayBox Neo Bypass Relay and GPI I/O Card is a cost-effective hardware solution designed and manufactured by PlayBox Neo to work with AdBox Neo. It provides a simple GPI I/O interface with third-party cue decoders, as well as a relay bypass in case of system or power failure. The bypass section has four BNC connectors and supports composite, SD-SDI, HD-SDI for full input-to-output isolation during bypass. Bypass is automatic during power failure or can be controlled remotely by serial protocol or COM API, and has a watchdog with a controllable timer. The GPI I/O section allows the easy connection of external cue decoders to AdBox Neo and provides simple connection for external devices such as alarms.